Upon first moving to the South, I was surprised to learn that deviled eggs were a staple of Southern entertaining for no other reason than that they are also extremely popular in some countries in Latin America. I love to serve them in my summer parties and ladies’ luncheons because—albeit dainty and elegant—they always offer a good dose of comfort that helps guests feel at ease. Grownups love them but so do the kids, and I think it’s the fact that they are just as pretty to look at as they are delicious to eat that makes them perfect for any crowd. There are as many recipes for deviled eggs as there are cooks, and you’ve probably encountered them embellished with all sorts of ingredients, including relish, onion, herbs, ketchup, olives, and capers. I first started adding chiles to my recipe as a way to add a little kick of flavor and provide a contrasting crunch to the natural creaminess of the eggs. The formula proved to be popular with both my family and friends, who often requested the recipe. Try them and you’ll see why. Place the eggs in a medium pan and cover with cold water. Set the pan over high heat and bring to a rolling boil. As soon as the water comes to a boil, cover the pan and turn off the heat. Let the eggs cook for 12 minutes. Plunge the eggs into iced water to stop the cooking process. Once the eggs are chilled, peel off the shells. Halve each egg lengthwise; scoop out the yolk into a small bowl, and set the egg whites on a plate lined with paper towels. Using a fork, mash the egg yolks into a paste; add the mayonnaise, onions, jalapeños, cilantro, parsley, mustard, salt, and pepper and stir together well. (If not serving immediately, cover the egg whites and the filling separately with plastic wrap and store in the refrigerator for up to 6 hours). Using a spoon (or a pastry bag), fill the egg white cavities with the egg yolk mixture (about 1 tablespoon). Chill them, loosely covered, until ready to serve (but no longer than 2 hours). 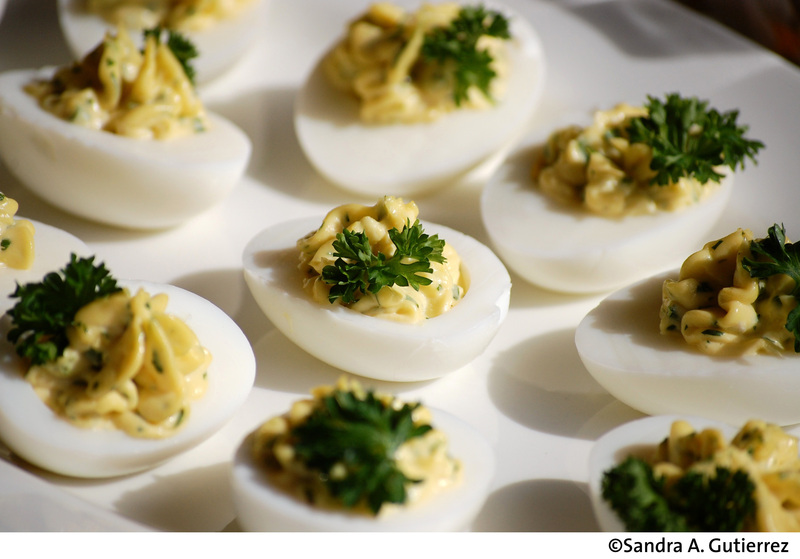 When ready to serve, sprinkle the eggs with smoked paprika and garnish with parsley. Serves 6. Recipe from The New Southern-Latino Table: Recipes that Bring Together the Bold and Beloved Flavors of Latin America and the American South. Copyright © 2011 by Sandra A. Gutierrez. Sandra A. Gutierrez grew up in the United States and Guatemala, is a journalist, food writer, culinary instructor, and recipe developer. She lives in Cary, N.C., with her husband and their daughters. Visit the author’s website at Sandra’s Kitchen Studio, and follow her on Twitter @sandralatinista. Keep up with the latest book events by liking the book on Facebook.